doosanlift | Doosan Industrial Vehicle America Corp.
Acrylic Tank Manufacturing (ATM) is the largest aquarium manufacturing company in the United States. In 1994, Irwin Raymer, also known to some as ‘The General’ moved from New York City to Las Vegas to build his home that would house a custom-built aquarium. During his search for the best aquarium company to complete his one-of-a-kind project, he met and hired Wayde King. It was this project that brought Wayde, Irwin, and Irwin’s son Brett Raymer together into their current venture – Acrylic Tank Manufacturing. featured on its own television show, Tanked. This increased their business substantially and diversified their customers. Now their portfolio includes high-end commercial and residential clients, well-known celebrities as well as the average person. With business booming, ATM needed durable equipment to build their aquariums and work within their factory. They also need reliable equipment since each job takes six to eight weeks on average. Before choosing Doosan, Wayde and Brett shopped around and visited over 10 different competitors. When asked how they felt about Doosan, they simply stated, “Unbelievable. The Best Thing Ever.” Since then, the company has always used Doosan trucks at their facility. building a relationship with them as well as going above and beyond to provide them with everything they need. ATM hopes this relationship continues to grow and they are excited about displaying additional Doosan products on their show. This entry was posted in testimonials and tagged #doosan, animal planet, dealership, forklift, forklifts, las vegas, machines, material handling, NV, productivity, reliable, service, tanked, testimonial, tv, tv show, warehouse on July 18, 2016 by doosanlift. Matheus Lumber is a national wholesale lumber distributor servicing heavy construction, multi-family residential and commercial construction, government agencies and global export markets. Since 1932, Matheus Lumber has had a long tradition of providing quality construction products and outstanding customer service to the North American building industry. They provide products not only throughout North America, but also to Japan, China and Australia. The company operates seven regional offices and supply yards in Washington, Idaho, Texas and Arizona. This entry was posted in testimonials and tagged #doosan, forklift, forklifts, Lumber, machines, material handling, Matheus, North America, productivity, reliable, service, testimonial, warehouse, Washington on January 21, 2016 by doosanlift. North American Pipe & Steel (NAP Steel) is a leading distributor of carbon steel pipes in the Pacific Northwest United States and Canada. Since 1984, NAP Steel has been a preferred solution for steel pipe supply, offering structural tubing and pipe that is widely used in hand railing, machinery parts, agricultural equipment, and steel structures. They are a top supplier of standard pipe, used as process piping, sprinkler pipes and machinery parts, as well as piling pipe, used inland and in marine construction for its high yield strength. NAP Steel is committed to providing the best customer service delivering value, reliability and quality every time. NAP Steel’s Seattle facility, located in Auburn, WA, requires durable and dependable equipment built to function continuously for 18 hours a day. The windy, Pacific climate makes for a tough work environment. 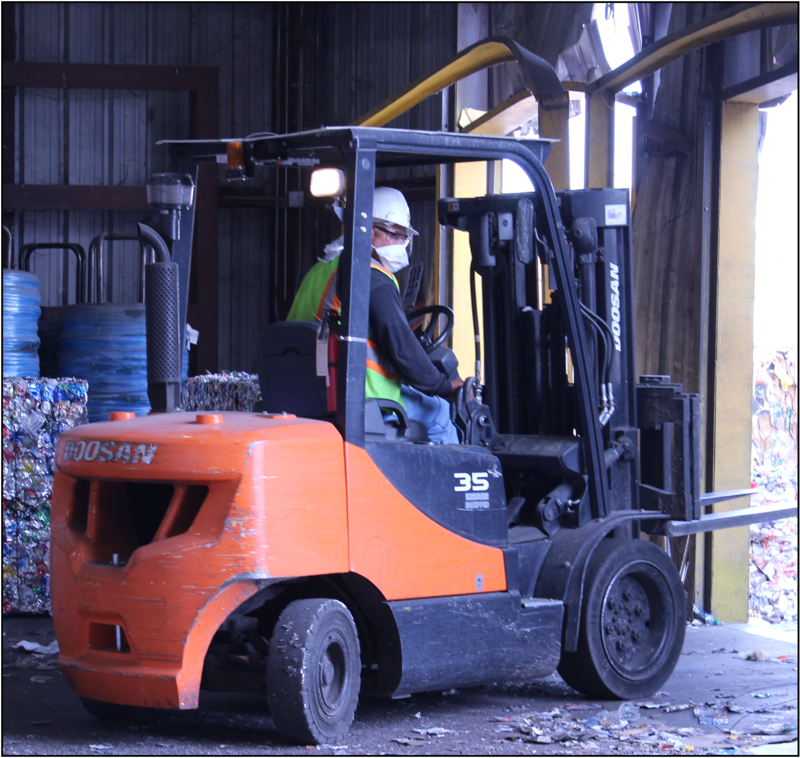 For years, NAP Steel has relied upon Doosan forklifts for their durability, value and comfort. NAP Steel’s Auburn location operates a fleet of D160’s and a D-70 that were ordered from MidCo Forklifts, a Doosan dealer located in Auburn, WA. MidCo Forklifts provided them with complete operator training and takes care of routine service and maintenance. “MidCo Forklifts is quick to respond to any issues and offers excellent service. Their service technicians are very personable and knowledgeable,” notes Brian Dent. This entry was posted in testimonials and tagged #doosan, D160, dealers, dealership, durable, forklift, machines, material handling, NAP steel, pipe, powerful, productivity, steel, testimonial, warehouse on December 7, 2015 by doosanlift. Arizona area. Founded in 2009 by Chris Perry and Ramon Jimenez, RAYTEK provides lighting maintenance for interior and exterior buildings and parking lots, sign installation and energy Refficient lighting retrofits. With over twenty years of combined electrical, lighting and sign industry experience as well as an L-11 Electrical Contractor’s License, RAYTEK maintains its dedication to customer service and quality work. Working with large retail chains and restaurants, including a recent signage job of over 35 coffee shops in the Phoenix area, RAYTEK needed a more effective solution to their material handling needs. The challenge of moving oversized crates full of light fixtures, signage and electrical materials between storage areas and company vehicles prompted the need for a reliable forklift. Perry worked with Vic Villont, Area Sales Manager at Reliable Forklift Sales, and selected the operator-friendly Doosan G25 lift truck. They added a side shifting fork positioner to handle various sized loads of signage and electrical materials. 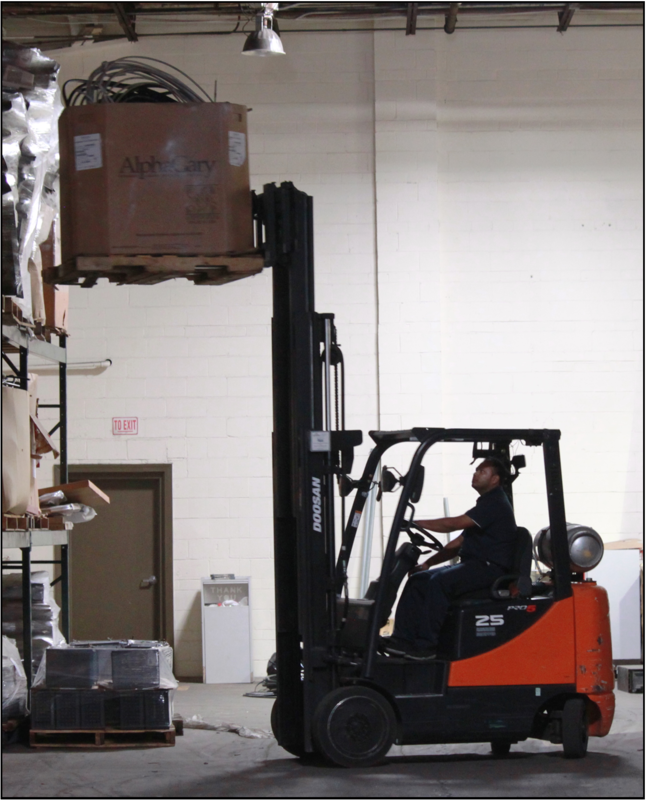 “Reliable Forklift Sales was incredibly helpful to us, loaning us a forklift to use before our new one arrived. They offer outstanding service and always make sure our Doosan is taken care of. We are very pleased with our new Doosan forklift and with Reliable Forklift Sales,” notes Chris Perry, Co-Owner, RAYTEK Lighting, Signs & Electrical. This entry was posted in testimonials and tagged #doosan, dealers, dealership, durable, forklift, forklifts, machines, material handling, productivity, RAYTEK, reliable, service, testimonial, warehouse on August 19, 2015 by doosanlift. Greentek Recycling Solutions of Charlotte, North Carolina provides public consumers and businesses various environmentally responsible recycling solutions for computers and other electronics. Greentek makes recycling easy with a variety of programs, convenient drop-off locations, pick-up services, and secure data destruction. 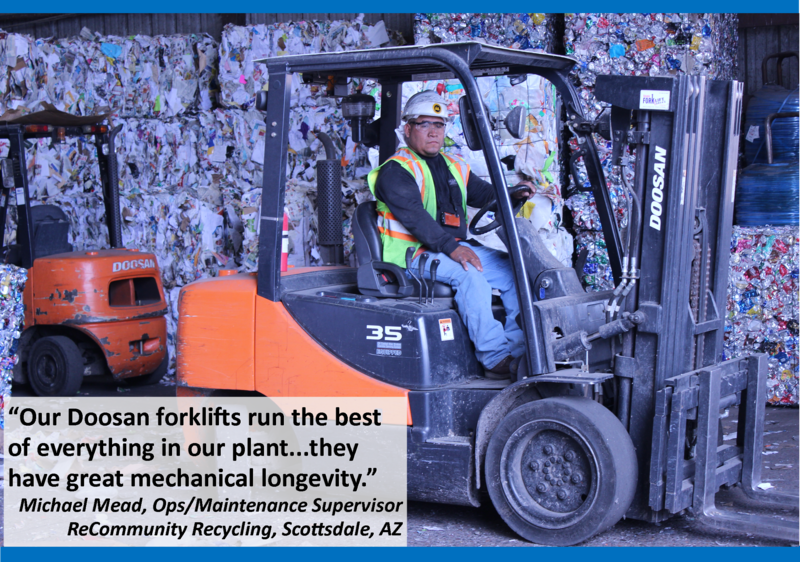 Ethan Gilbert, founder of Greentek Recycling Solutions, is a fifth-generation recycler with an extensive background in recycling metals and operating recycling facilities. Gilbert says the biggest issue he faces daily is conveying “the importance of earth protection in a throw-away community.” Since its foundation, Greentek has developed a cost-effective, productive way to move and store recycled electronics, plastics, metals, batteries and more. Gilbert worked closely with Atlantic Forklift Services, an exclusive Doosan dealer in Charlotte, to select the right lift truck to suit Greentek’s needs and the company’s long-term vision of growth. He chose the Doosan GC25 for its high power, fuel efficiency, and economical benefits. “The GC25 has improved our productivity and allowed us to free up additional storage space needed to support our growing business,” explains the young entrepreneur. With their material handling needs met, Greentek is now poised to thrive in this dynamic and growing industry. This entry was posted in testimonials and tagged #doosan, dealership, durable, forklift, forklifts, machines, material handling, NC, north carolina, productivity, service, storage, testimonial, warehouse on May 20, 2015 by doosanlift.